IT WAS ONLY last week that we found an anti-Google coalition created by Microsoft. Whether EPIC is yet another one would be hard to say for sure, but it is not likely because of age and history (track record). Whether Microsoft has influence in this group is another matter altogether. There are many reports at the moment about this group called EPIC going against Google. It was not easy to find a Microsoft connection (we did investigate this briefly), but the comments in TechDirt offer one possibility and also demonstrate that it’s a repeated pattern. I went over to their site to see who is behind this group. http://epic.org/epic/advisory_board.html Not surprised to find someone from Microsoft. Oh, lool, there’s’ is Ray Ozzie. However, they also have Vint Cerf, Joi Ito and Bruce Schneier as advisers. Wierd. See guys, if the FTC shuts down Google services, everyone has to go elsewhere for their collaboration tools. What was Ray Ozzie doing before Microsoft? Running a corp that made a collaboration tool called Groove! That tool was dead before he got on at M$, and it’s really dead now (just an extra piece of Office). They are after Google to increase the penetration of Groove and Sharepoint, plain and simple. There is another Microsoft employee in this group: Stefan Brands. To the group’s defence, at the beginning of the decade it did have a motion against Microsoft (Passport). This does not mean that the pendulum has never swung the other way. I hope I don’t regret saying this, but I don’t believe that EPIC has been corrupted by Microsoft to be an anti-Google entity. EPIC (and the EFF) both have a very clear and strong privacy-rights platform, and I don’t think that either are anti-Google per se. Google’s sheer size and influence can create the privacy-rights equivalent of a gravitational black-hole whereby what would be acceptable practice by a smaller organization becomes unacceptable when practiced on Google-scale, but I believe that EPIC (and the EFF) are positioned to protect people against *behaviors*, not *companies*. I see this as quite different than pure proxy plays, where an organization is so obviously beholden to advocate for a sponsor’s policy position that they will advocate against the interests of the public in order to serve their private masters. I am not convinced that EPIC is even close to reaching that point with respect to their stance on Google or their dependence on Microsoft. 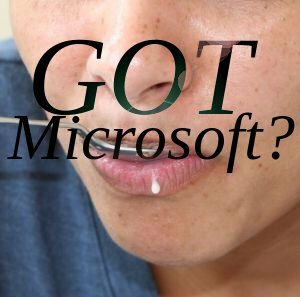 But you are right to point out that we should watch for it, and you are right to point out that Microsoft’s history of extreme self-interest is such that without rehabilitation, *any* association with *any* Microsoft executive or initiative is to be treated with the utmost suspicion. And certainly the daily examples you provide of Microsoft’s continued bad behavior delays the day we can all mark the beginning of Microsoft’s rehabilitation, so EPIC would do best to keep Microsoft at arms length. I never really thought that Microsoft was the motor here, unlike, for example, the report cited at the beginning of this post (coalition created by Microsoft). That’s why I chose the heading with a question mark. I still worry somewhat about Microsoft’s Chris Wilson in W3C. Nokia and Apple have not helped OGG so much, either. Microsoft’s Window Snyder recently left Firefox, which is generally doing great work to promote OGG. I think Christopher Blizzard is the reason for this.